Although you may have known that February was Black History Month, you, like the Accidental Locavore, might have been unaware that it is also National Grapefruit Month. Maybe it was our haste to see this shortest month (in days anyway), get itself over with, but there in my email was this interesting factoid along with its 2013 must-have – the infographic. Back to the grapefruit. 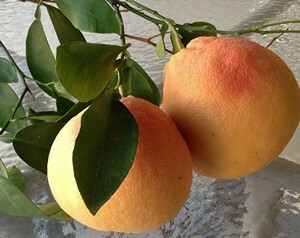 Did you know they’re called grapefruit because they grow in clumps on the trees, just like grapes? Had to go out to the yard on a little bit of fact-checking (it’s true). My serving and eating preference for grapefruit is to cut them in half, cut the sections, toss on a tiny bit of sugar (old habit from childhood) and eat. Grapefruit juice is always good, too. I don’t cook with grapefruit, or use it in salads and unfortunately, a lot of the people I know can no longer eat it (bad combo with statins). But since my buddy Bradley had asked me to blog about National Grapefruit Month (in return for a 6-pack of San Pellegrino’s Pompelmo – truth in blogging here – I’ll let you know how it tastes later on) and I was mere feet from more than anyone could possibly consume, it was time to try something I’ve been curious about for a long time – Grapefruit Brûlée. Here’s the recipe (such as it is). Figure ½ grapefruit per person. Preheat the broiler to high. 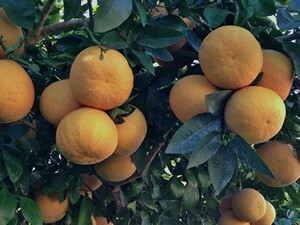 Cut the grapefruits in half (around their equator) and cut the sections. Place on a baking sheet. Sprinkle each half with 1 tablespoon of light brown sugar. Place under the broiler until the sugar melts and starts to brown, about 8 minutes depending on your broiler. Serve and enjoy! My verdict: Ho-hum. 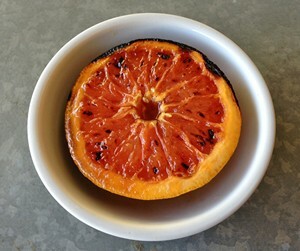 The fruit was well-cooked without much of that crack of sugar of a good brûlée. It was probably due to a not hot enough broiler (something I’ve been experiencing lately). If you did it in the classic way with a blow torch, it could be much better. The torch would melt and brown the sugar, without cooking the fruit. They make fancy blow torches for cooking, but you can just go get a regular one from the hardware department and do some plumbing gigs on the side. PS: You may also, like me, hate getting things like this on the last day of the month, but I just got it myself, so let’s cut a little slack here (and here’s a hint: grapefruit will taste just as good in March. Try it and let me know!). 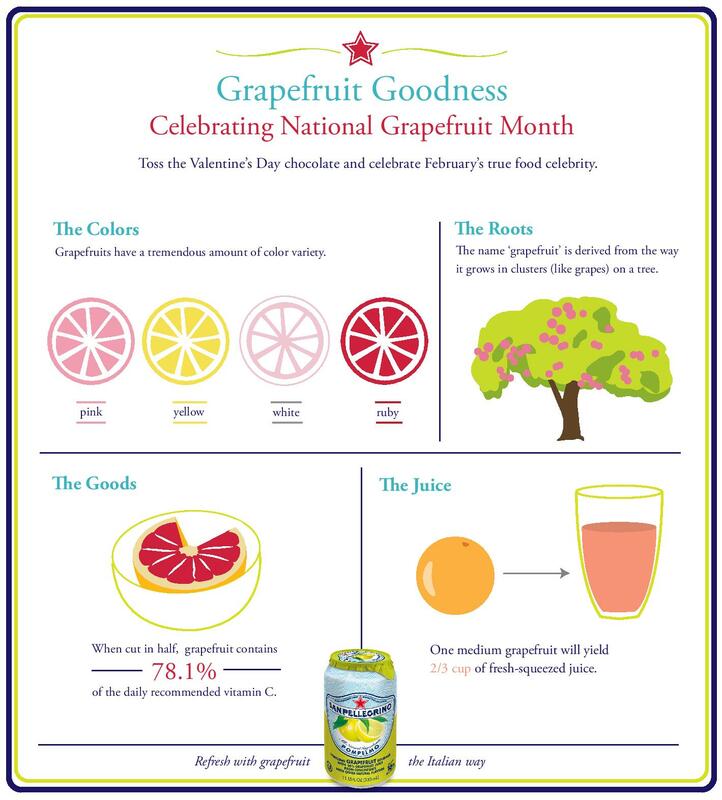 Thanks to San Pellegrino Sparkling Fruit Beverages for the use of the infographic.